Here's another lovely adjustable bangle bracelet. 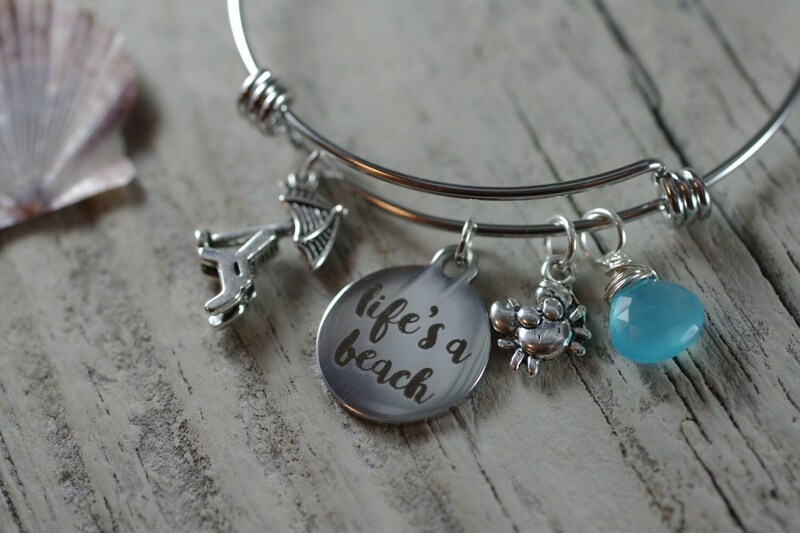 If you've always loved that saying "Life's a Beach" you'll want to have this bracelet. It has two charms, a beach chair and umbrella and the most adorable crab you've ever seen! Pick your color of wire wrapped briolettes (see last photo). The bracelet is made of a high quality stainless steel and the beach chair/umbrella charm and crab charm are a zinc alloy metal. Aqua (shown), Blue Green, Ocean Blue, Clear, Pink, Lavender or Chocolate. You pick the stone. Love this beach bracelet! Beautiful!